It's a big day today in Tamilnadu. 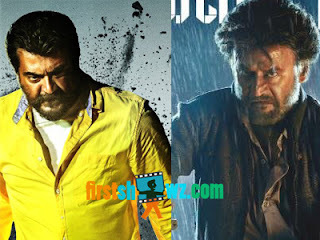 Two biggies Superstar Rajinikanth, Thala Ajith Kumar's most awaited films Petta and Viswasam are releasing with huge expectations today among fans. These two films created huge buzz with their latest released trailers and sets new records in Internet with most likes and views throughout. Most of the theaters were crowd filled for the advance bookings and the theater management has also closed their tickets counters very fast due to the heavy demand. Due to Pongal Season, the film's both in Tollywood and Kollywood were in confusion in allocation of theaters. However, Ajith's Viswasam is only releasing in Tamil Version while Rajinikanth's Petta is simultaneously releasing on Tamil and Telugu Versions. Petta is being directed by Karthik Subbaraju and produced by Sun Network with Simran and Trisha are seen in female leads opposite Rajinikanth. Music Director Anirudh provides tunes. While Viswasam has Ajith in dual roles and Nayanthara is seen as love interest for Ajith. Siva directed this film and produced by Sathya Jyothi films with D. Imman as the music composer.